Over the course of the last weekend of September, I attended the Pat Rodgers Memorial Revolver Round Up hosted by Hardwired Tactical Shooting in Carrollton, Texas. The 2018 course focused on snub nosed revolvers. In anticipation of the event, I reached out to several companies for products designed with the Ruger LCR in mind. 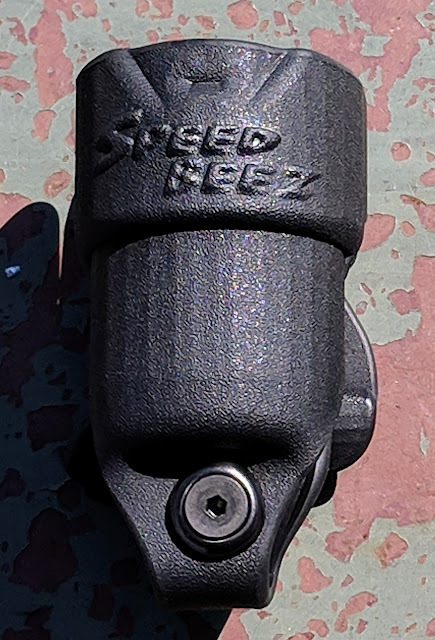 Speed Beez answered my request and sent both a speed loader and a matching kydex carrier for test and evaluation. In addition to my experiences at the course, I was also able to do a bit more testing at a local match. Last weekend, one of the local clubs hosted an IDPA BUG (Back Up Gun) Match. The current rules permit five shot revolvers under 22 ounces. Those requirements fit my Ruger LCR .357 perfectly AND a fellow shooter had a few extra Speed Beez loaders and carriers for me to borrow! 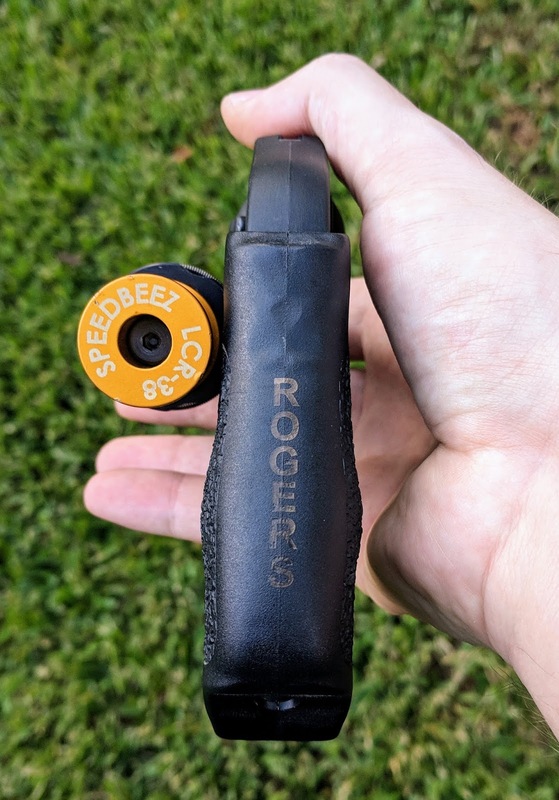 After some challenging (but fun) days on the range, here are my thoughts on these two products. The Speed Beez Model LCR38-05 is designed for the five shot Ruger LCR. The loaders feature an aluminum construction with large brightly anodized handles. The bases are slightly relieved to mimic the cylinder and use an external spring to retain the loaded rounds. The handle rides on a guide that is under spring tension. The handles are milled with posts that push the rounds into the cylinder. In the case of center-fire ammunition, the posts contact the rim of the case to avoid ignition. The opposite is true in their rimfire speed loaders. Best of all, the loaders are manufactured in the USA! 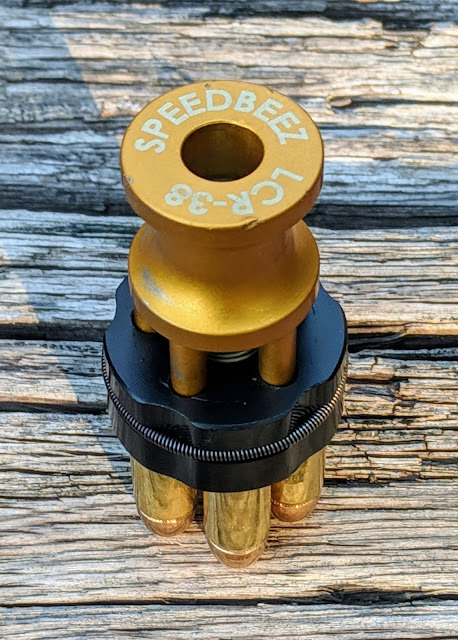 The Speed Beez speed loader design is intuitive in both the loading and reloading processes. Simply orient the rounds to the chambers and continue to push the handle until the rounds click in place. This requires a firm push to release the cases, but also prevents accidental release of the rounds. This system works well, especially in a competition environment. There is just enough tension in the external spring to hold the rounds securely in place while in a carrier; however, rounds can pop out if thrown into a pocket without protection. If you intend to carry these for self defense, make sure they are riding around in a carrier! The range portions of the Revolver Round Up were shot on a concrete range. Over the course of that weekend, this loader was dropped at least a dozen times from waist height. Aside from a few dings and a little finish wear, the Speed Beez loaders continued to function. I also wanted to get the loaders a little dirty and found that opportunity at the BUG match. I dropped them into mud and sand during each course of fire. I gave them a quick shake and loaded them up for the next stage. No problems over six stages. That's the sign of a good product! Speed loader fitment can occasionally be an issue with certain models of grips/stock. When I first received the loader, I was a little worried about the speed loader clearance with my selected grip from Holster Ops. Thankfully, this proved to be a non issue with the precision milled base matching the cylinder exactly. In addition to the large variety of speed loaders in their inventory, Speed Beez also offers three sizes of speed loader pouches. I really appreciate it when companies provide quality accessories for their stuff. These carriers are manufactured by Comp-Tac and are constructed of injection molded plastic. Tension is adjustable and is controlled by the screw at the bottom. The model I received arrived at the perfect setting, no adjustments needed. These are a great design! 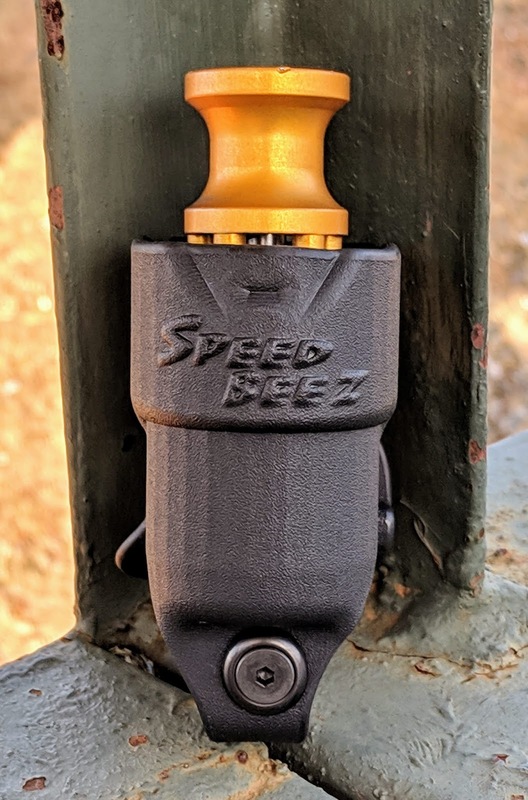 I really like Speed Beez products! This is certainly not my first (or last) experience with their gear. My Smith & Wesson 929 competition rig currently sports a Moon Clip Belt Rack and holster. I have also purchased several .22lr loaders and the associated loading blocks, so I expected the center-fire versions to function well. The all aluminum construction of these speed loaders was a wise decision for Speed Beez, albeit an expensive one. Polymer loaders can be had for half or even a third the price with a hunting. While their loaders are a bit pricey, you are receiving precisely milled parts that are manufactured in the United States. Quality gear is expensive, but a worthwhile investment for the advantages this design offers. If I continue to shoot the LCR in IDPA BUG, I might need a few more loaders and carriers. Speed Beez, any chance you could manufacture a double speed loader carrier for IDPA? 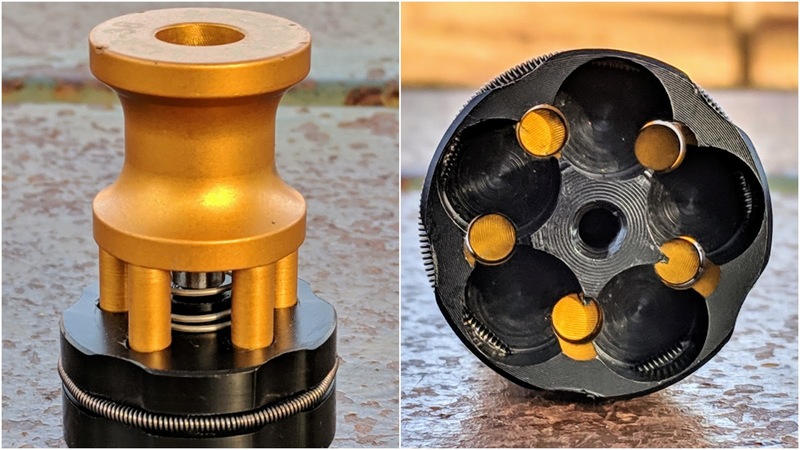 If you are in need of a speed loader, loading block, or other revolver gear then please visit their website for more information. I know I'll be making another order soon! Great review my friend. . . enjoyed shooting with you!